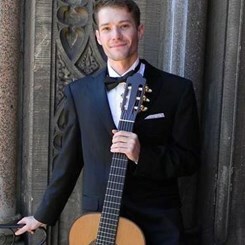 In addition to guitar, Mr. Streckfus has long-standing interests in numerous music topics, including music theory, music history, ear-training, bass, ukulele and piano. He also has a love for music technology, and his knowledge of music equipment in general is invaluable for an aspiring guitarist. He often incorporates and explains effects, metronomes that sound like real drummers, chord detection programs and interactive games that help students develop the necessary fundamentals to become successful musicians. More than anything, Brian Streckfus is motivated by a desire to give back to the music community, to keep the art of music alive and available, and to improve music pedagogy by incorporating technology. It isn’t unusual for to him work on and teach rock music, electronic music, improvisation, Indian ragas, and classical music on the same day. The versatility of his chosen instrument, and the sense that there is always something new and exciting around the next corner, is what he believes keeps his students coming back for more. Request Lessons with Brian Streckfus today!